The most prominent of all is that of Sage Vasishtha, who chose this place to worship Goddess Tara as he knew she was an avatar of Sati residing there. After practicing several austerities, Vasishtha was unsuccessful in appeasing the Goddess. Finally, after divine intervention and under the instruction of Lord Buddha in Tibet, Vasishtha worshipped Tara with left-handed tantric ritual using five forbidden things like wine, meat, blood, etc. The Goddess at last pleased by Vasisthas penance appeared before him and blessed him. Vasishtha requested the Goddess specifically to manifest herself in the form of a mother suckling Shiva on her breast, the form which Buddha had seen in his divine vision. The Goddess willfully accepted his request and thus manifested in the said form into a stone idol. Tarapith is also famous for being the place where the great saint Bama Khepa (1837 AD – 1911 AD) popularly known as the “mad saint” performed Tantric sadhana (worship), which resulted in his becoming the spiritual head of Tarapith. At one point of time, Tarapith used to be known as Chandipur and it served as a devotional place for many hermits. Soon it became the holy place for large number of hermits and it was then that a temple was constructed. The first temple was constructed by a rich businessman of the period named Joy Dutta Saudagar. This temple became dilapidated and it was replaced by another temple built by Jagannath Rahi of Mollarpur. It’s destruction lead Raja Ram Jeevan to construct another temple in 1720. The temple standing now is a reconstructed temple by the King of Nator. The temple is considered extremely sacred and people belonging to varied religions come here to receive the Goddess’s blessings. It is believed to be a wish – fulfilling temple since legends have that no one goes empty handed from the doors of this temple. This is why millions of devotees assemble here every year to offer their reverence, puja and obeisance to the Goddess. Places to see at Tarapith: The main and primary attraction in Tarapith is the Temple of Goddess Tara and the adjacent cremation ground. Apart from these, the greenery around Tarapith and the meandering Dwarka River is a feast to the eyes. The samadhi of the famous saint Bama Khepa is also located near the temple near the cremation ground. Birchandrapur – Located 10 km away from Tarapith, Birchandrapur is the birth place of Nityananda Swami, who was one of the co-founders of the Gouriya Vaishnavism religion along with Sri Chaitanya Mahaprabhu. The town has been named after Birbhadra Goswami – the son of Nityananda. According to legends, this holy town was said to have been inhabited by the Pandavas once during the Mahabharata era. 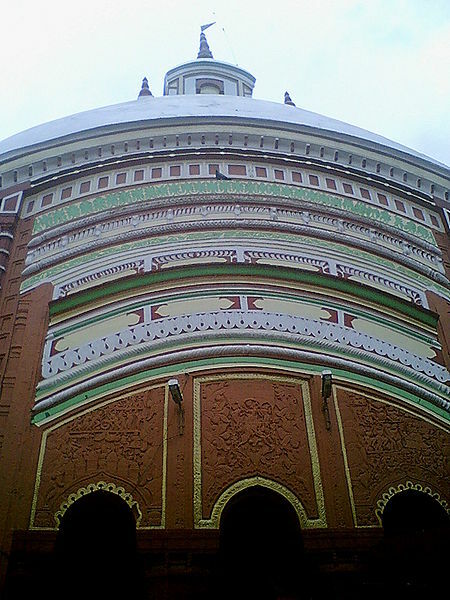 The ‘Akali Mandir’ at Akalipur is unique for its hexagonal design and is more than 300 years old. There is also a beautiful ISKCON temple situated here. Mallarpur Shiv Temple – It is one of the oldest shrines of Birbhum district that was built in 1192 AD by the Hindu King Malla Raj. 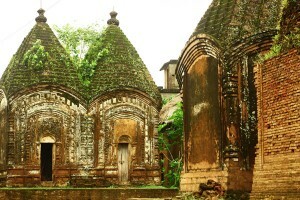 The Shiva temple is surrounded by 21 temples with a sacred tank in its eastern flank. It is about 10 kms away from Tarapith. Lakshmi Temple – This temple of Goddess Lakshmi is said to have been built 500 years ago by a Hindu saint called Saint Kamdev Bramacharya. He built the idol of the Goddess himself with neem tree wood and Ganga soil. The temple is a very revered spot and is visited by many devotees. It is about 12 km from Tarapith. Maluti Temples – Located in the nearby state of Jharkhand, it is considered to be a world heritage site due to its terracotta temples. Maluti has a total of 110 temples that were built during the 17th and 19th centuries by Basant Rai of the Mala dynasty. These temples are workmanship of exquisite terracotta architectural design. However, presently there are only 58 temples left. Things to do in Tarapith: Other than temple hopping and doing some puja, you can take a stroll around the paddy field and enjoy the serene ambiance. Plus, visiting some of the above mentioned nearby places can also be a great idea. How to reach Tarapith: Tarapith is well accessible by road and railway. It is about three and half hours by train from Kolkata city. The nearest railway station near Tarapith is Rampurhat which is about 9 kilometers from Tarapith temple. 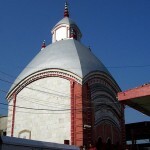 Tarapith is also well connected by bus routes with other districts of West Bengal. Tarapith is about 294 km from Kolkata, 116 km from Durgapur, 205 km from Mayapur and 96 km from Santiniketan. Best time to visit Tarapith: The period between October and March is the best season to visit this temple town and its nearby attractions. The temple can always be visited throughout the year. However, summers are very hot and humid here with the temperatures soaring as high as 40 Degree C. Winter is the best time for sightseeing sprees around the temple city. 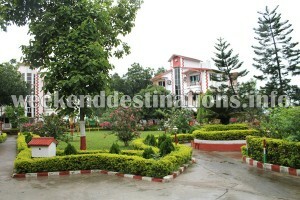 Lodging and dining facilities at Tarapith: There are two different types of accommodation options available at Tarapith. There are hotels with all modern facilities near the temple and there are resorts with lots of greenery, open spaces around 2 kilometers from the temple. It all depends on your preferences, where you want to stay. Deluxe hotel near temple: Just a walk from the temple, this deluxe hotel has all modern amenities like underground parking, lobby, children park, capsule lift, dining hall and AC as well as non AC rooms with attached western bathrooms. If you want to stay in a comfortable hotel near the temple with all modern amenities, then this hotel could be your choice. 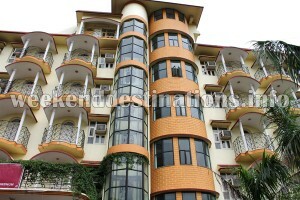 It is a nice spacious hotel near the market with all amenities. Resort in the outskirts: A resort with landscaped gardens, swimming pools, fruit gardens, flower gardens, conference hall, boating facilities, 24-hour power back-up, lily pool, multi-cuisine restaurant and whole lot of modern amenities are available for the guests in Tarapith. Located around two kilometers from the temple at Tarapith and surrounded by greenery, the resort has all AC rooms equipped with modern amenities like bathtubs in bathrooms, tea/coffee maker, wardrobes, Televisions and more. The resort also arranges for free pick-up and drop to the temple. Photographs by Sumit Baran and others. I like your writing style really enjoying this weekend getaway site. Is there any bus available from Kolkata to go to Tarapith? Please let know. There are regular C.S.T.C. buses from Esplanade to Tarapith too.